We help make scheduling simple. ScheduleBreeze is the software companion for Managers of Their Homes. It reduces your time creating your schedule with software tools like drag-and-drop functionality. Many moms use it, so why don't you join them? Register your Managers of Their Homes book. Login or create a username on ScheduleBreeze. First, read the ScheduleBreeze information page. This will give you information about using the software, and give you the opportunity to try ScheduleBreeze for a week. To purchase ScheduleBreeze, you must first be a registered owner of Managers of Their Homes. The registration page is the last page in the book, and must be sent in prior to purchasing ScheduleBreeze. When your registration has been processed, you can register for a username, and proceed with purchasing and using ScheduleBreeze. ScheduleBreeze is an internet-based program that is a companion to Managers of Their Homes. 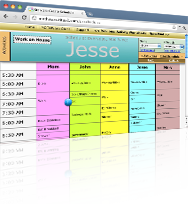 This software streamlines and digitizes the process of creating your schedule. The program contains drag and drop technology and fast easy updating mechanisms, to save you time and make your job as easy as is possible. I was the first one to be able to test ScheduleBreeze, and I loved it. It was so simple to use, and the schedule-making process went quickly. I could get my activity worksheets set up and then drag and drop those activities onto the schedule. I could change activities in the blocks easily if something didn't work where I originally placed it. I could make multiple schedules, and I could print them with just a click of a button. I worked in ScheduleBreeze tonight and really liked it! I was wanting to tweak my current schedule which has transitioned from being on the fridge to being in my head. It helped me to see everything written out on screen and be able to move things around. You did a very good job with it!!! With the ScheduleBreeze program it was just so easy. You just click for this and add that. It was really very easy and user friendly. Wow! This is a wonderful tool. I just finished using it to make and print our our school schedule for the fall. It was easy to use and truly organizes my family’s day so well. I love that I can print it with everyone’s assigned color. Thank you, thank you!!!! To read more about ScheduleBreeze, you can go to this link. ScheduleBreeze is only $15.00 a year, which divides out to $1.25 a month. A homeschool mother's greatest challenge may be "getting it all done." Managers of Their Homes offers solutions! Responses by families who have read Managers of Their Homes and utilized the Scheduling Kit indicate the almost unbelievable improvements they have realized. For only $25.00 you can purchase from Titus2.com. Owning this book and registering it is a prerequisite to using the software. During the registration process, we will ask you to verify that you have sent in your paper registration.